Your first ever ski or snowboard holiday is an introduction to a sport that will keep you coming back for life. Wintersports holidays are fun, outdoor experiences which you can share with friends and family, you can meet new people, explore fabulous mountain landscapes and enjoy breathtaking scenery. Ski manufacturers have developed equipment specifically for women. So why shouldn't there be ski coaching available that is specific to women as well? It is probably no secret that in general women learn skiing in a different manner to men. Women will want to fine tune something before really putting things into full action. Men however, are generally more inclined to just have a go and then fine tune. So women will be keen perfect their technique to avoid falling down - men will learn by falling down. So we felt that girls only courses could really help the dynamics of the learning environment for a small group of women. This season women keen to learn off piste and all mountain skills can join our courses in Chamonix specifically for women. This allows women to learn at their own pace, and to develop their skiing and understanding. 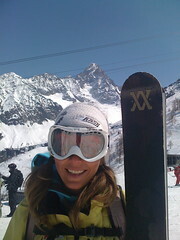 The courses are with Claire Summers who is one of Britain’s leading ski instructors (BASI level 4 ISTD). Claire has vast experience coaching skiing across Europe for all levels, particularly coaching groups for off piste skiing. She is patient and understanding with a real talent for passing on her number 1 passion. In her spare time Claire competes in international freeride skiing competitions around Europe - with some impressive results! The courses are structured the same as our mixed All Mountain ski courses with the aim of developing confidence through control, versatility and expression. Claire will help you to improve your technical, tactical, psychological and physical skills in a relaxed, non-pressured atmosphere. If you would like more information such as dates, levels etc, please see our website. Ask a keen French, Dutch, American, Swiss or Austrian skier about what they think of chalet holidays and you'll be met with a blank look at best, sheer incredulity at worst. Why would you want to go on holiday and share your dinner table every night with a bunch of strangers, or sit and have pre and post dinner chats with them, have breakfast with them, maybe even share a bathroom with them? The chalet holiday is a particularly British invention - and whilst other nationalities might dip their toe in the water to test it, it remains one of those curious British exports that we do best. So just what is it that makes the chalet holiday so popular and so unique? The chalet holiday first appeared in the 60's when enterprising Brits would rent a chalet for a week or two, install the daughter of one of their business associates in the city to cook and clean, and invite their friends over. It was an extension of the shooting weekend, when the gentry would congregate at country houses to shoot wildlife and chat over dinner. As the idea took hold and developed throughout the 70's and 80's it remained largely an upper class concept - chalet girls were often keen skiers just out of Cheltenham Ladies College or Roedean. These Camillas, Lucindas and Samanthas didn't need to be paid much more than pocket money and their ski season would arm them with important skills for later life when hosting dinner parties for their stockbroker, lawyer or banker husband. They would happily cook, serve and pour the wine whilst charming and chatting with their guests, probably collecting a few marriage proposals as well as tips along the way. Since those days the chalet holiday has become mainstream - your chalet host is just as likely to be called Stacey as Samantha, or even Gavin - but the idea of the charming chalet host lives on. They will make your bed, pour your wine, serve you wonderful gourmet food on a budget, and help smooth the way for you as you get your feet. It's the personal touch - you'll be sharing your chalet with just a few other guests - so you will get to know your chalet host and he or she will be able to tell you where's best for apres-ski drinks, where to ski on the first day, how to get to the lifts, the best way to get back to the chalet - and all those little tips which might take you a couple of days to work out otherwise. The services offered are often extended nowadays to include ski guiding, packed lunches, English newspapers, a lift to ski lifts. In many cases you can pick and choose the level of service you want. At the heart of the chalet experience is the food. There's no need to traipse round a supermarket buying basics or going to a cafe everytime you want a coffee. English tea is on tap. Cooked breakfasts, afternoon tea and cakes, good homemade meals - this is what you'll find in a chalet holiday and what gets people coming back for more. What's not to like? Many chalet companies will take pains to get English ingredients too - mincemeat for mince pies, Marmite, bacon and more. Part of the experience is also the "mucking in" - earn points with your chalet host by stacking the plates and helping out a little. As the chalet holiday has evolved so has the catering on offer. Chalet food can range from gourmet to hearty and wholesome. However it will always be freshly prepared. As every chalet company worth their salt knows their reputation hangs on the talents of their hosts. Another key ingredient of a chalet holiday is the way that it throws you together with people you have never met and by the end of the week you could be ski buddies or more for life. Whilst it's certainly not unusual for a group of friends to take their own chalet, you can always book a room in a chalet for you and your partner and see what happens. On the first evening there will be a little awkwardness as you meet your fellow guests at the dinner table for the first time. As the week pans out the awkwardness will gradually disappear. It could be replaced by much joviality as you gradually get to know your fellow guests. You're all bound together by the ski experience - so it's an easy way to open up a conversation. Of course it's not guaranteed that your fellow guests will be the kind of people you'd invite to your home - but in a way that's also part of the charm of the chalet holiday. The pot luck - will it be life-changing, will you hate them all, or will it just be a little dull? This is all part of the experience. So if you have yet to try a chalet holiday we can certainly recommend it - convenient, comfortable, personal and fun! Have you had a chalet holiday? Why not let us know your opinions or experience. Leave us a comment or contact us at info@chaletsdirect.com .